People who have had a stroke need to learn to do many daily activities all over again. Hand-eye coordination, balance, the ability to get dressed and walking may all be affected. According to the National Stroke Association, 40 percent of stroke patients have serious falls in the first year after their stroke because of balance problems and arm or leg paralysis. Exercises that strengthen muscles and improve balance and coordination can make walking after a stroke easier. Improving hip control is an important part of walking after a stroke. Hip muscles can be weakened and cause problems with balance and the ability to take full, confident steps. The National Stroke Association recommends lying flat on the floor with your unaffected leg flat on the floor and your affected leg bent at the knee. Lift your affected leg and cross if over your unaffected leg at the knee. Lift your affected leg again and return it to its original position. 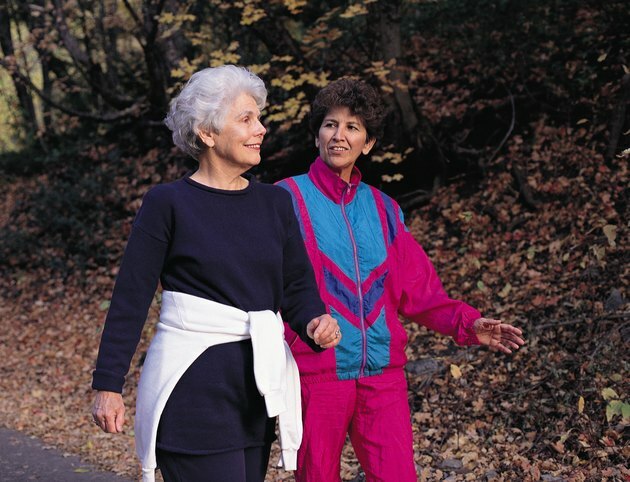 Repeat the crossing and uncrossing several times to help strengthen the hip for walking. Improving knee function after a stroke is an important part of regaining the ability to walk. Weak knees can lead to balance problems and feelings of insecurity when taking steps. The National Stroke Association suggests lying on your unaffected side with your bottom knee bent for stabilization and your affected arm in front of you for support. Begin with your affected leg straight and bend your affected knee by sliding your heel toward your buttocks. Then slide your heel back to its original position, straightening your knee. While doing this exercise, concentrate on keeping your hip straight while you are bending your knee. Proper weight shifting is important for balance and overall control while walking. Essentially, it means finding your walking rhythm again after a stroke. The National Stroke Association encourages stroke victims to start on the floor on hands and knees, making sure your weight is evenly distributed between both arms and both legs. Rock in a diagonal direction back toward your right heel and then forward toward your left hand. Slowly repeat this motion as many times as you can, rocking as far as possible to one side and then the other. Cardiovascular endurance is an important part of walking after a stroke. Cardiovascular activity improves circulation, strengthens the heart and makes walking for longer periods of time less difficult. The American College of Sports Medicine recommends treadmill walking as appropriate for stroke patients. Treadmill walking helps improve gait efficiency, which means walking requires less energy. This reduces stress during exercise for those who are recovering. Your physical therapist will help you determine what treadmill settings are best for you as you go through stroke rehab.